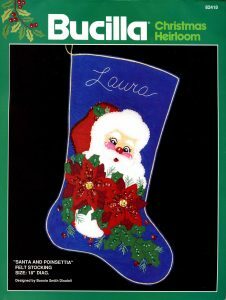 Bucilla Santa And Poinsettia ~ 18" Felt Christmas Stocking Kit #82418 Holly Face - FTH International Sales Ltd.
18″ Felt Christmas Stocking Kit #82418. This is a discontinued 1987 pattern so if you love it please make sure you don’t miss the chance to purchase this rare and hard to find kit. This beautiful vintage kit designed by Bonnie Smith features a Jolly Santa Face peering over an armful of brilliant red Poinsettia flowers and deep green Holly and Christmas greenery. The Royal Blue background edged in gold trim is the perfect color to show off the glittering sequins and rich red, white, and green colors in the design. 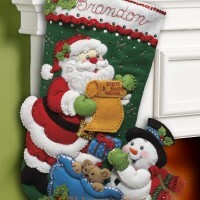 It would be hard to find anyone who would not be absolutely delighted to find this stocking hanging on their mantle on Christmas morning. 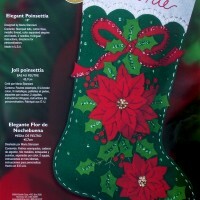 Bucilla felt applique stockings are a Christmas tradition. 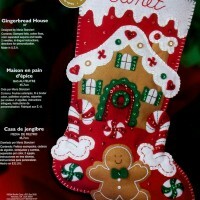 This cute stocking would be a great gift for anyone who appreciates a work of love that they could cherish forever.